Mayor Bill de Blasio and New York City Economic Development Corporation (NYCEDC) President Maria Torres-Springer recently announced the winners of NYC's 2015 BigApps contest, which challenged tech-savvy New Yorkers to create innovative apps that would help in the fight against social and environmental challenges facing the city. The winning designs address four key issues identified by the mayor's OneNYC plan: Affordable Housing, Zero Waste, Connected Cities, and Civic Engagement, and demonstrate innovative new ways to make life in the Big Apple better and greener. 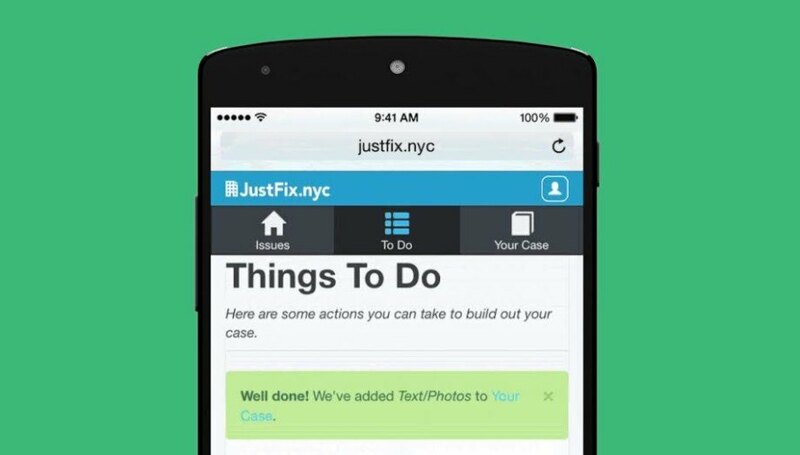 JustFix NYC aims to help New York renters get organized in order to take care of needed repairs to their apartments. Getting things repaired or even inspected is an arduous task for any Big Apple renter, but near impossible for those living in low-income neighborhoods. To help renters improve their living conditions, the JustFix app gives users a personalized plan of attack based on the issues of the living space, neighborhood, and HPD code violation datasets. The app allows users to store and sort all photo evidence and any important documentation. Through the app’s mobile-first website, tenants are able to share this information with advocates, lawyers and judges. Treasures is a useful resource that allows New Yorkers to share unwanted objects with others in their community with the goal of reusing and recycling items rather than throwing them out. The app encourages users to take photos of discarded objects and post them on the app. This process is aimed at reducing the amount of waste in local landfills as well as fostering a sense of sharing within the NYC community. Of course, finding things for free doesn’t hurt either. CityCharge is a solar-powered charging station that aims to be the new modern picnic spot for New Yorkers. Equipped with WiFi, the stations comprise comfy tables with chairs that let passersby take a seat and enjoy the fresh air as they recharge their devices. The stations are also set up with Bluetooth and beacon technology to gather environmental data such as air quality, noise levels, pedestrian traffic, etc. Benefit Kitchen is a benefit screening tool that provides low-income families with eligibility information on public benefits. Using the app, families can learn about their eligibility and the amounts of eighteen federal, state, and local benefits available. The information found in Benefit Kitchen can really make the difference between putting food on the table or going hungry. Addicaid is a digital support network focused on helping individuals struggling with substance disorders enter and stay in recovery. According to the New York State Department of Health, over 1.9 million New Yorkers have a substance abuse problem, so this app is a much needed resource for those struggling to recover from an addiction. IssueVoter is a nonpartisan, end-to-end constituent engagement tool that provides voters with information regarding important policy questions and allows users to monitor their representatives’ records as well. Users can choose issues that are important to them such as education or healthcare. Based on the input, IssueVoter tracks and summarizes related bills and will send users alerts when bills related to your categories are introduced. The app will summarize the ins and outs of the often complex legislation wording as well as related news items. This process is aimed at not only informing the public about current legislation, but also to see which elected officials are really representing their constituents. To help renters improve their living conditions, the Just Fix app gives users a personalized plan of attack based on the issues of the living space, neighborhood, and HPD code violation datasets. Treasures is a useful resource that allows NYC to share unwanted objects with others in their community with the goal of reusing and recycling items rather than throwing them out. City Charge is a solar-powered charging stations with comfy tables with chairs that let New Yorkers take a seat and enjoy the fresh air as they recharge their devices. Benefit Kitchen is a benefit screening tool that provides low-income families with eligibility information on public benefits. Addicaid is a digital support network focused on helping individuals struggling with substance disorders enter and stay in recovery. Issue Voter is a nonpartisan, end-to-end constituent engagement tool that provides voters with information regarding important policy questions and allows users to monitor their representatives’ records as well.